While there are many types of caves, most caves are found in karst terrain. Karst is a landform where l ayers of water soluble rock, such as limestone, dolomite, or gypsum are found. These rocks are dissolved by slightly acidic groundwater forming features such as caves and sinkholes. Caves are a unique resource. 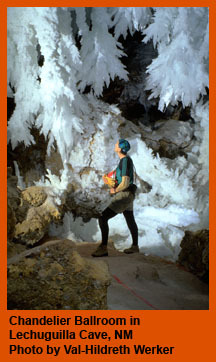 The goal of cave management is to secure, protect, and preserve significant caves on Federal lands for the perpetual use, enjoyment, and benefit of all people; to foster increased cooperation and the exchange of information between those who use caves for scientific, education, or recreational purposes; and to allow compatible recreational and other uses that will not cause irreversible damage to outstanding cave resources or harm cave-reliant organism. 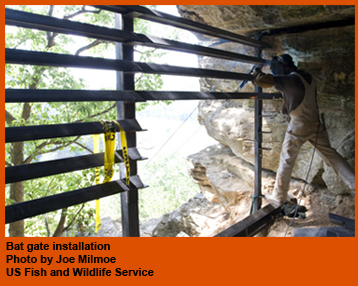 The Forest Service manages caves to maintain their geological, scenic, educational, cultural, biological, hydrological, paleontological, and recreational values. This includes the responsibility of conserving biodiversity through the management of caves and providing special protection for threatened, endangered, and sensitive species that live in caves. Caves offer irreplaceable habitats for rare plants and animals, some of which spend their entire lives in complete darkness. Many species found in caves are rare and require the specific environmental conditions of caves for breeding and hibernation. For this reason, their survival is endangered if the cave environment is damaged or altered. If destroyed, these isolated environments have little change to regenerate. Caves offer valuable clues to our prehistoric and historic past, as well as significant geologic events. Deep underground, caves have preserved the fossils of humans and extinct plants and animals. Caves, with their nearly constant temperatures, preserve sensitive archaeological and cultural sites such as burial grounds and sites used for religious practices. Geologists can gain new insight into the history of the earth by studying cave rocks and minerals. Scientific studies continue to discover the unique resources inside these underground passages. 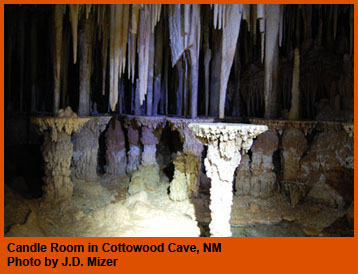 The Forest Service recognizes that caves are a sensitive resource and must be protected. Caves are intimately linked to the surface. We cannot protect them without protecting the lands that contribute water and nutrients to them. Delicate cave ecosystems require water, air, and organic matter in constant quantities from surface sources. Seemingly minor, unrelated actions on the surface can have dramatic impacts on the caves below. Currently many caves on Forest Service lands are closed to public access to prevent the spread of White-nose syndrome. TheForest Service is actively working with other land management and research agencies, the caving community and other NGOs to manage the unique and fragile cave and karst resource. Caves are formed primarily in karst areas, which are identified by sinkholes, springs, sinking streams and caves. Karst landscapes feature underground streams and aquifers that supply the wells and springs that communities use for drinking water. Sinkhole - A rounded depression in the landscape formed by water slowly dissolving the rock below or, in some cases, when an underground cavity collapses. Losing stream – A surface stream that loses a significant amount of its flow to the subsurface through bedrock openings. Spring – A cave filled with water, which is discharged to the surface. Cave – A cavity formed beneath the earth’s surface, when water dissolves the limestone or dolomite by chemical action. CLICK HERE for the lesson plan, "Sinkholes in a Cup." Caves are a rich source of yet-to-be discovered knowledge of the world around us. The National Park Service Cave and Karst Program emphasizes stewardship, responsibility, science, cooperation, coordination, and education. This link include information to help protect and preserve fragile caves and karst ecosystems. In this activity, students will construct a 3-D paper model that shows how water moves through karst and cave systems. Peering into the model's cave opening reveals a miniature diorama with many cave features. Students can recreate Paleolithic cave paintings and learn about karst landscapes, features, groundwater and human activities. In this journey you can find out all you've ever wanted to know about caves and the many organisms that live there. This resource guide was prepared for use in middle and secondary schools in Alaska, but it teachers elsewhere will find the information useful. 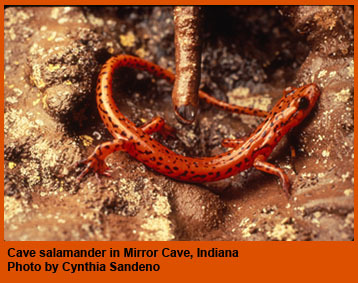 Learn about the pressing geologic issues that affect Indiana, which include karst information. The Indiana Geological Survey presents information and links so that Indiana’s citizens and our representatives in state and local governments can make sound decisions based on good geologic data. Topic areas include ground water, mapping, coal, oil and gas, and seismic risk. More and more people are becoming interested in caves. As awareness of our underground resources grows, so has the need for prompt, unbiased information. Recently, the Indiana Karst Conservancy approved a consolidated plan to close this knowledge gap. It includes regional coordinators, traveling trunks of activities and related materials, training more educators, a database, and media coverage. Advance cave and karst science by conducting, coordinating, and facilitating research. Serve as a repository for and provide analysis and synthesis of speleological (cave related) information. Foster partnerships and cooperation in cave and karst research, education, and management programs. Promote and conduct cave and karst educational programs. Promote national and international cooperative programs that further cave and karst research, education, and stewardship. Develop and promote environmentally sound and sustainable cave and karst management practices. With nearly 12,000 members and 200 grottos, the National Speleological Society does more than any other organization to study, explore, and conserve cave and karst resources; protect access to caves; encourage responsible management of caves and their unique environments; and promote responsible caving. Check out the wide variety of videos about bats, cave animals and microorganisms, and cave ecology.